My reference on this chrome plated Mobil Gas example is Bachmann's Smokey Mountain Express train set from the early 1990s. The same early '90s catalogs also feature a Mobil Gas car in the Rolling Stock section, but it may not be the chrome version. From promotional train set made in the '80s for Zenith. 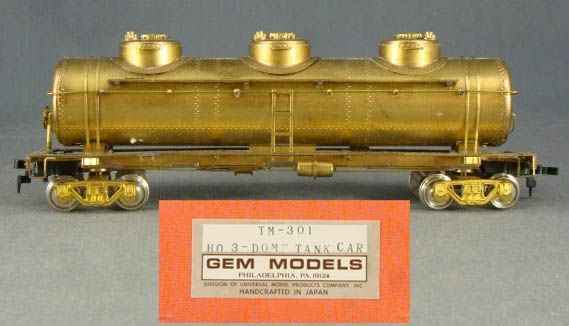 Bachmann's 42' 3-Dome Tank Car is among the first group of HO-scale rolling stock offerings in the company's 1970 product catalog. 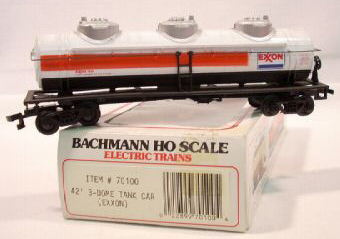 Bachmann adds no new roadnames to this car's offerings in the 1972 catalog. 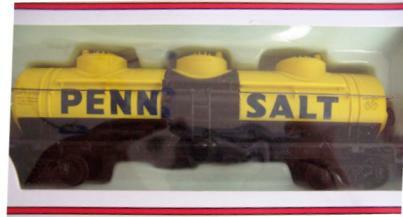 The suggested retail price for the 42' 3-Dome Tank Car is $3.00 in 1972.